As Deputy Michael Keane was taking a group of church ladies to a play he sees a man about to jump off of a bridge into the river below. As Michael rescues the jumper the man tells him that he will be sorry that he saved him. Sure enough a few days later Michael receives pictures in the mail of a dead girl. It doesn't take long for Michael to realize that he is being set up for murder. The question is why would the jumper target the man who rescued him? As seems to be my habit I started with this second book in the series. I don't think reading the first book is necessary to get the background of the characters in the book, so that is a good thing. I really liked Murder Comes By Mail. There was quite a bit of suspense wondering who would be the next victim. Some of the characters in the town of Hidden Springs are quite entertaining. I enjoyed Aunt Lindy's no-nonsense teacher attitude. Hank the newspaper man was a bit annoying, but did prove useful. Betty Jean, secretary at the Sheriff's office, was quite a character. Desperate to find a husband but no options have presented themselves. Alexandria, Michael's love interest, is a lawyer in Washington, D.C. whom he has been best friends with since grade school. All of these people make up just a part of the small-town life of Hidden Springs. There were some things that I think could have been answered more clearly but for the most part I think this was a solid mystery/suspense. 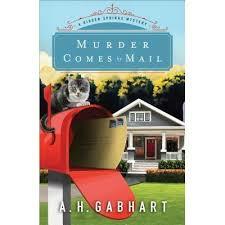 A.H. Gabhart is a new author for me and I plan on checking out other books by her.